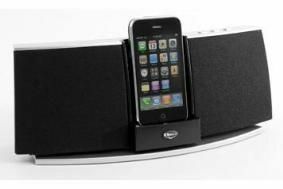 Klipsch updates its iGroove SXT iPod speaker dock | What Hi-Fi? There's also an S-video output to allow videos to be shown on a TV. The iPod Shuffle and other portable players can be connected using an auxiliary input on the rear. A long-throw 6.5cm bass unit and 19mm horn-loaded tweeter is used for each channel, and the unit now employs biamplification for less distortion, plus revised bass port tuning. The iGroove SXT is available now direct from Klipsch, and from Amazon and other leading retailers.